The Beavercreek Historical Society was founded in the early 1980's following the discovery of a two-story log home under the clapboards of a structure about to be razed. 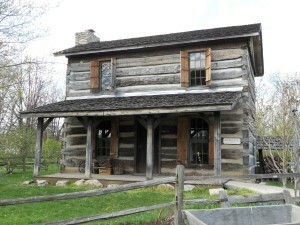 In the years that followed, the Society has coordinated with Beavercreek City and Township to establish a log cabin museum at Wartinger Park. The cabins are decorated to period and open for display for special events at select times of year. 'The Beavercreek Chronicles', published by the Society, is an entertaining literary work that documents the settling of Beavercreek. It also highlights the growth and development of our area with special attention paid to the families and individuals who created the foundation for the wonderful community we now enjoy. The Beavercreek Historical Society is comprised of local residents as well as those with historical ties to Beavercreek and invites you to membership as well! Membership dues are very reasonable and include many benefits - including the quarterly 'Log By Log' newsletter.